Basking Ridge is an unincorporated community located within Bernards Township in the Somerset Hills region of Somerset County. As of the 2010 Census, the population was 26,747. The area settled during colonial times. 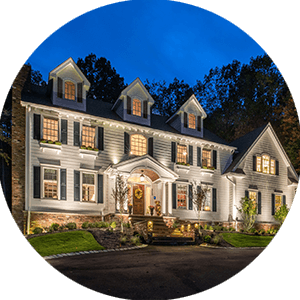 The community of Basking Ridge is part of greater Bernards Township, which also includes Lyons, Liberty Corner, and West Millington. The name Basking Ridge first appeared in the early 1700s, supposedly inspired by the woodland animals that climbed up to a ridge to bask in the sun. Today, much of that ridge is filled with housing, which was greatly expanded in the last two decades through a multiphase development known as “the Hills”: thousands of condos, town houses and single-family homes built by some of the state’s biggest housing development companies. 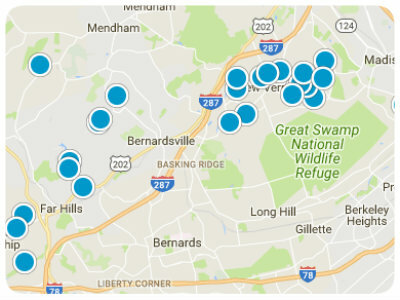 Check out Basking Ridge market statistics HERE! The upscale Bridgewater Commons Mall which includes Bloomingdale's, Macy's, Lord & Taylor and 160 specialty stores including a movie theater is about 13 miles away. The Mall at Short Hills, an upscale shopping mall anchored by Neiman Marcus, Saks Fifth Avenue, Nordstrom, Bloomingdale's and Macy's is 18 miles away. 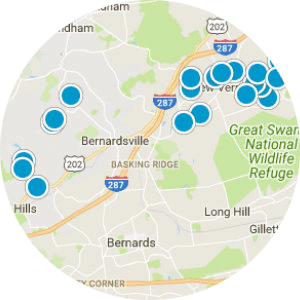 Basking Ridge holds a number of local restaurant/bars: Visit Riverwalk Center and dine at 3 West Resturant, the Urban Table, or Ling Ling Chinese cuisine. The Ridge Tavern, located in the heart of quaint Basking Ridge, is a family friendly casual restaurant and bar. 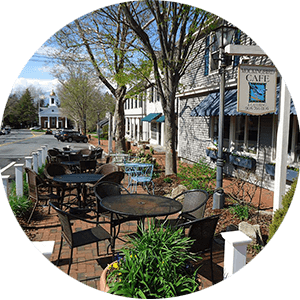 Known for its historic atmosphere and American inn fare, the popular Grain House Restaurant is located next to The Olde Mill Inn Hotel. Dating back to the 18th century, the Grain House Restaurant offers colonial charm surrounded in rich woods, striking hearths and richly beamed ceilings. There are several parks within the town. Four are county parks: Lord Stirling Park, Rebel Hill, Southard, and Harry Dunham. The fifth is Pleasant Valley Park which contains the town pool and miles of woodchip trails. Pleasant Valley Pool Features four separate pools/play areas for swimmers of all ages; including an interactive water play area and 50 meter "z" shaped main pool with diving tank, plenty of "dry" facilities; including a sand volleyball court, shuffleboard court and bocce courtand, and acres of grass to spread out a picnic lunch or purchase a meal or snack at the full service concession stand. What some may be surprised to find is a town residents that blends a rural setting with an urban vibe. The former comes from deep history and vast open space, both of which residents work hard to preserve. The latter is credited to the eclectic population, and to the many recreational, business and cultural possibilities. The Bernards Township School District serves Basking Ridge. It has four elementary schools. Ridge High School is a four-year public high school serving students from Bernards Township in Somerset County. Ridge High School was the 9th-best public high school in 2012 as rated by the New Jersey Monthly magazine, and was the 194th best high school in the United States as rated by Newsweek, being the top-rated comprehensive high school in New Jersey, beating out other high schools rated higher on the New Jersey Monthly magazine. Morristown Medical Center which is part of Atlantic Health System and one of the top Hospitals in New Jersey is only 8 miles away. New Jersey Transit's Gladstone Branch runs through Basking Ridge. There are two stations that residents can use to get to New York City and Hoboken. Lakeland Bus Lines (Route 78) provides service to and from Manhattan during peak commuting hours.